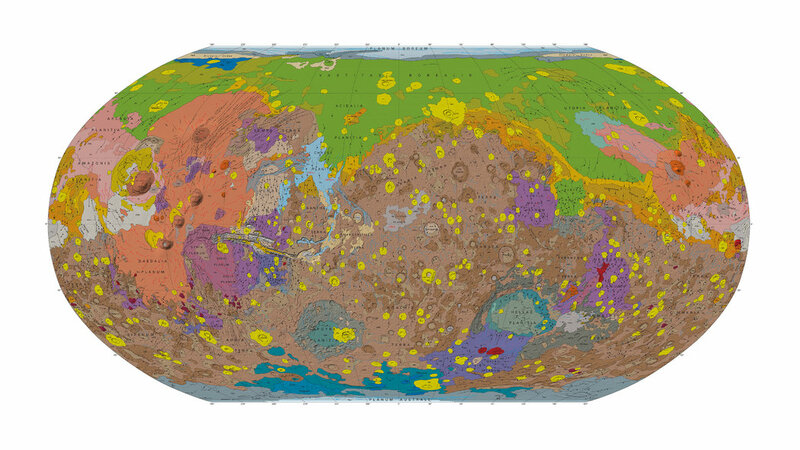 Scientists at the U.S. Geological Survey (USGS) have released a new global geologic map of Mars, which records the distribution of geologic units and landforms on the planet’s surface through time. It is based on the unprecedented variety, quality, and quantity of remotely sensed data acquired since the Viking Orbiters. These data have provided morphologic, topographic, spectral, thermophysical, radar sounding, and other observations for integration, analysis, and interpretation in support of geologic mapping. In particular, the precise topographic mapping now available through laser altimetry has enabled a consistent portrayal of the surface for global mapping. Also, they use thermal infrared image bases, which tend to be less affected by atmospheric haze and are reliable for analysis of surface morphology and texture at even higher resolutions. Links: USGS Map 3292 hompeage with further resources, PDF with detailed key (file is 35 MB), external link to movie of rotating geologic surface of Mars (Credit: Jennifer LaVista/USGS), NY Times article describing the new map, Eos article by Ken Tanaka (link to PDF). In Chapter 15 (the opening photo, p. 382, and Figure 15-15d, p. 395), we discuss the prospective effect of a gas cloud called G2 (“G” for “gas”) that was heading for the center of the Milky Way, perhaps dropping material in to the supermassive black hole known as Sagittarius A* (pronounced A-star) and causing it to flare brightly in x-rays and radio waves, at least. But the prediction for its closest approach is about now, mid-2014, and no brightening has apparently happened. It is still possible that there could be dramatic flaring in the future, but that could be years or decades off. Daryl Haggard, who has recently moved to Amherst College from Northwestern University, is lead author of a report of Chandra X-ray Observatory monitoring of “Sgr A*/G2” through six observations in the first half of 2014, including the predicted time of the closest encounter. These articles describing the situation is available free online, and the main results are discussed by correspondent Ron Cowen in The New York Times for July 22, 2014. Links: NY Times article by Cowan; the original ApJ article by Oliver Pfuhl, Stefan Gillessen, and a dozen others; Daryl Haggard’s report, from The Astronomer’s Telegram. 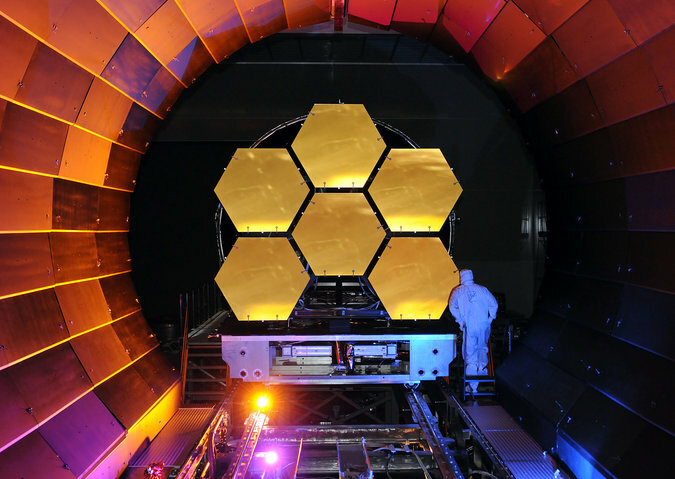 Read an up-to-date survey of various new telescopes and systems, by Dennis Overbye of The New York Times (July 21, 2014). Links: the NY Times article by Dennis Overbye. However, while taking a snapshot of Mauna Kea, Hawaii’s highest mountain, from Germany is an impossible feat, Rosetta’s camera OSIRIS is doing a great job at catching ever clearer glimpses of its similarly sized destination. Images obtained on July 14th clearly show a tantalizing shape. The comet’s nucleus consists of two distinctly separated parts. “This is unlike any other comet we have ever seen before,” says OSIRIS project manager Carsten Güttler from the MPS. “The images faintly remind me of a rubber ducky with a body and a head,” he adds with a laugh. 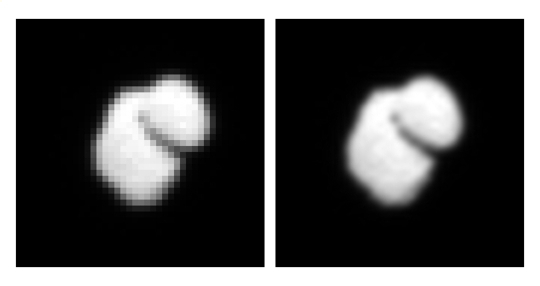 How 67P received this duck-like shape is still unclear. “At this point we know too little about 67P to allow for more than an educated guess,” says Sierks. In the next months, the scientists hope to determine more of the comet’s physical and mineralogical properties. These could help decide, whether the comet’s body and head were formerly two individual bodies. Links: the original MPS press release and media files; an interactive movie (requires a Flash player) depicting Rosetta’s journey through the Solar System to reach Comet 67/P C-G.
New images of Comet 67P/Churyumov-Gerasimenko reveal an extraordinarily irregular shape (see p. 213). It has become clear that this is no ordinary comet. Like its name, it seems that comet 67P/C-G is in two parts. ESA scientists have made this movie, using a sequence of 36 interpolated images each separated by 20 minutes, providing a truly stunning 360-degree preview of the overall complex shape of the comet. It supports the presence of two definite components – one segment seems to be rather elongated, while the other appears more bulbous. Indeed, some people have already likened the shape to a duck, with a distinct body and head. Note that the comet’s surface features won’t be as smooth as these processed images imply. Dual objects like this – known as ‘contact binaries’ in comet and asteroid terminology – are not uncommon. Indeed, Comet 8P/Tuttle is thought to be such a contact binary; radio imaging by the ground-based Arecibo telescope in Puerto Rico in 2008 suggested that it comprises two sphere-like objects. Meanwhile, the bone-shaped Comet 103P/Hartley 2, imaged during NASA’s EPOXI flyby in 2011, revealed a comet with two distinct halves separated by a smooth region. In addition, observations of asteroid 25143 Itokawa by JAXA’s Hayabusa mission, combined with ground-based data, suggest an asteroid comprising two sections of highly contrasting densities. Is Rosetta en-route to rendezvous with a similar breed of comet? The scientific rewards of studying such a comet would be high, as a number of possibilities exist as to how they form. Links and further resources: the full ESA press release; link to unprocessed (still) image; link to movie. on p. 392, column 1, line 5, add: “(See Section 3.8c, Figure 3–32a.)”. Note that strips (a) through (m) are organized top to bottom. An article in New Scientist summarizes work by Michael Wong at Caltech, published in the journal Icarus, about how Titan keeps its surface methane liquid. Saturn’s largest moon may once have been a giant snowball. Titan is already a frigid moon made mostly of ice. But methane gas in its atmosphere keeps the surface just warm enough for a scattering of lakes filled with liquid hydrocarbons. Scientists have puzzled over Titan’s atmospheric methane because the molecule is easily broken down by sunlight. Calculations suggest that all the methane Titan seems to possess should have been used up within tens of millions of years – a blip in the moon’s roughly 4-billion-year lifetime. Adding to the mystery, the methane breakdown creates other compounds that rain over the surface, helping to fill the lakes. If used-up methane was replaced, this process would happen constantly, so Titan should be covered not by lakes, but by a global ocean hundreds of metres deep. 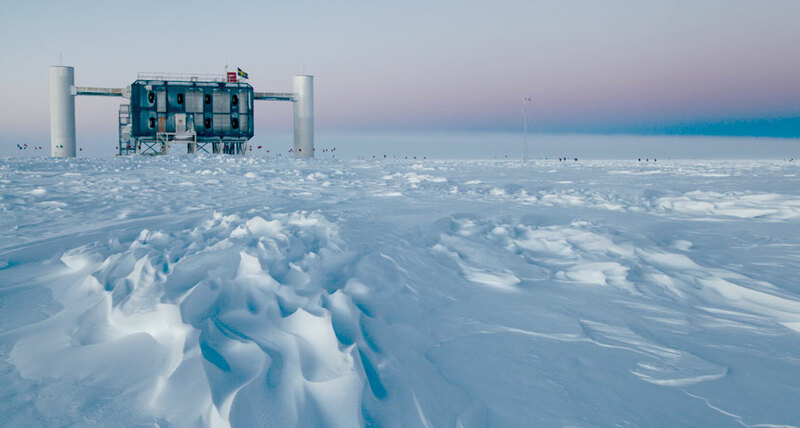 Michael Wong at Caltech says snowballs may be the missing piece. Scientists suspect Earth went through a snowball phase about 2 billion years ago, when the planet became covered in ice. A similar event could have taken place on Titan, says Wong. Methane levels may rise and fall if the gas is periodically released from inside the moon. If at some point the methane dropped by a factor of 100, temperatures would fall, and surface liquids would freeze over. A different mix of compounds would also be produced in the atmosphere. So this cold snap would mean the moon’s surface should host lots of compounds called nitriles, which would be solid rather than creating an ocean. The New Horizons mission to Pluto could offer early clues. Like Titan, Pluto has an atmosphere that is mostly nitrogen with some methane. Pluto’s atmosphere is much thinner and colder, but the physics are similar enough that examining its composition could boost the snowball model. Links: the New Scientist report; Icarus article. An article in ScienceNews describes experiments on Earth about making a probe that can penetrate far enough into Europa’s surface ice to figure out what might be in Europa’s invisible ocean. Jupiter’s moon, Europa, looks just as desolate and uninviting as any other place in the outer Solar System. Its frozen façade is colder than the most frigid spot on Earth by more than 100 degrees Celsius. Blasts of radiation sweep the surface. But beneath Europa’s inhospitable exterior, scientists think a vast ocean of liquid water flows. The moon’s seafloor might also bustle with activity from volcanoes and hydrothermal vents. 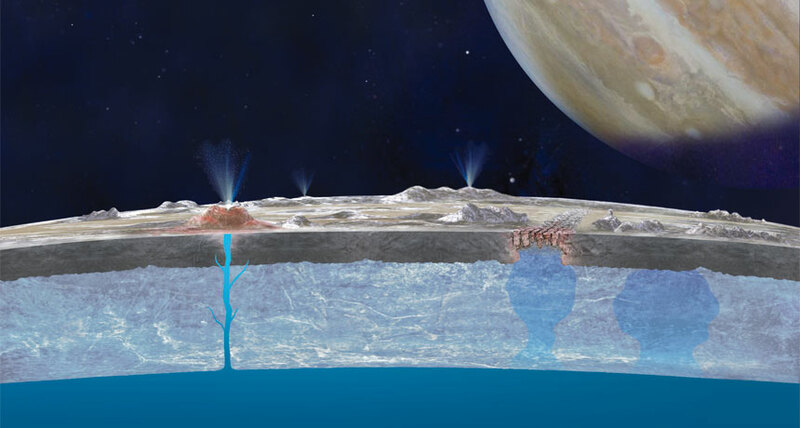 If chemicals from the surface trickle down through the ice, as some scientists suspect, Europa could hold all the necessary ingredients for life. The idea of exploring this vast ocean has launched a number of scientists on a quest for a space-ready ice drill. Somehow, such a device has to breach the moon’s icy shell — perhaps with blazing hot metal or the jagged teeth of a drill bit — and carry enough power for the job. The device has to be simpler and more reliable than anything used to bore through ice on Earth, and it will have to take care of itself — there’s no way to send a team of engineers to the far edges of the Solar System. And the entire ice-tunneling, power-toting, problem-free package needs to be light enough to launch beyond Earth’s gravitational grip. Research teams are now exploring the different approaches to penetrate, drill, burrow or melt through Europa’s icy shell. Read more about these varied projects at ScienceNews.